Achill is famous for a number of things; one of those is its fantastic pool players. 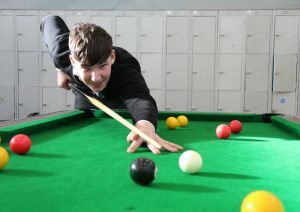 Coláiste Pobail Acla is now participating in the Mayo inter-schools pool competition in both boys and girls. The format of the competition is between four schools, Coláiste Pobail Acla, St Brendan’s Belmullet, Coláiste Chomáin, Rossport and St Tiernans, Crossmolina. If we play to our ability we have every chance of bringing home the silverware.